One of the most effective pieces of advertising you can do is wrapping your vehicle, especially if it’s out on the road a lot. 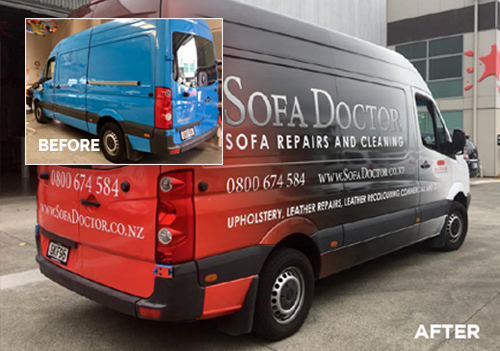 Sofa Doctor approached us with an idea to transform his fleet of mobile sofa repair vans. And what a transformation it is. From blue to red, grey and white, the van gets a complete make over thanks to the vehicle wrapping team at Marketing Works. Digitally printed and applied in house using 3M wrapping film and univision, the transformation was completed in about 2 days. From design, to print and application, we can do it all and the results can be seen all over town. To give your business a boost, give us a call for a free no obligation quote.